Sometimes, all of the elements of a holiday come together to make one perfect trip: accommodation, food and experiences. That’s what happened when we stayed at Khem Villas in India, making it an experience I’ll never forget. 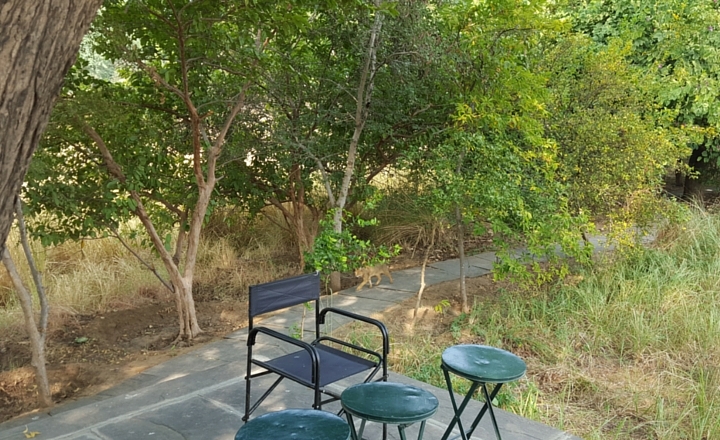 Khem Villas is a small eco jungle camp in the Ramthambore National Park in Rajasthan. To say it’s luxurious would be an understatement. 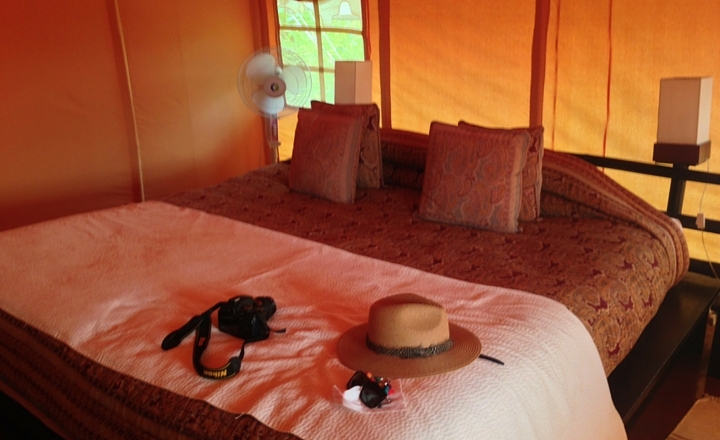 With a choice of rooms, cottages and tents we decided to stay in one of the tents which was designed to look like the hunting tents of old. That’s where the similarity ends. 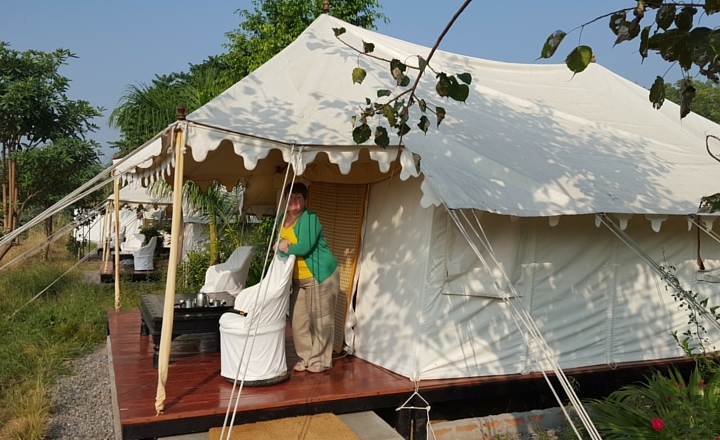 We were greeted with a giant bed swathed in layers of blankets, and a bathroom with a bamboo shower cubicle and monsoon shower which was much appreciated after a safari when my face was yellow with dust. 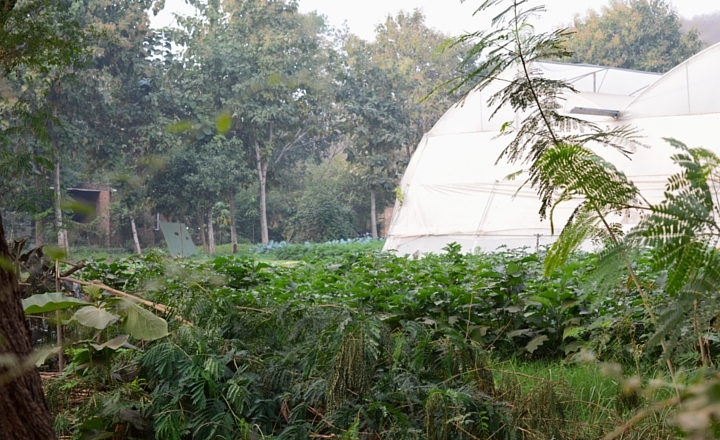 The handful of tents have decks overlooking the field where wheat and pulses are grown for the kitchens, and where, just days before we arrived, a female tiger had been spotted about 10 metres from our tent. Eek! That there is a jungle cat! It’s about 50% bigger than my cats at home but surprisingly jumpy! We were free to walk the paths which go all around the resort, and there was so much wildlife there is was easy to forget we weren’t on the actual safari. The large ponds are home to crocodiles and we’d sit reading by one as a baby croc sunned itself on the opposite bank! 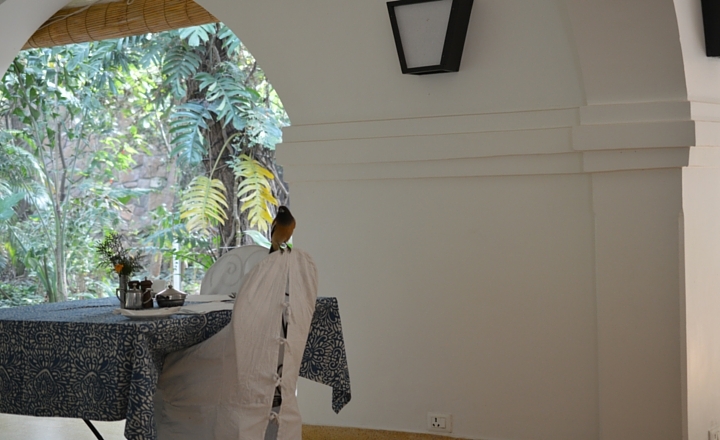 The site is also home to loads of birds, many of which would hang around the dining room and decking for crumbs, and some jungle cats. We were lucky to see the jungle cat on a couple of occasions but I was relieved that it wasn’t our tent it tried to get in one morning! Khem Villas is 100% vegetarian, and serves the kind of food that makes you forget you were ever a meat eater. This is seriously good food and it is also full board because of the distance from anywhere; meaning there are plenty of opportunities to enjoy the delights from the kitchens. The dining room has open walls so you can enjoy the views and the breeze while you eat. Breakfast is a mix of freshly made breads, fruit and Indian or western hot options made to order. It’s a really laid back and indulgent start to the day. If you’re booked onto a morning safari, the staff send you off with water and sandwiches and breakfast is served when you return. Lunch is served in time for afternoon safaris and I guess you’d call it a buffet but it is served to you at your table. 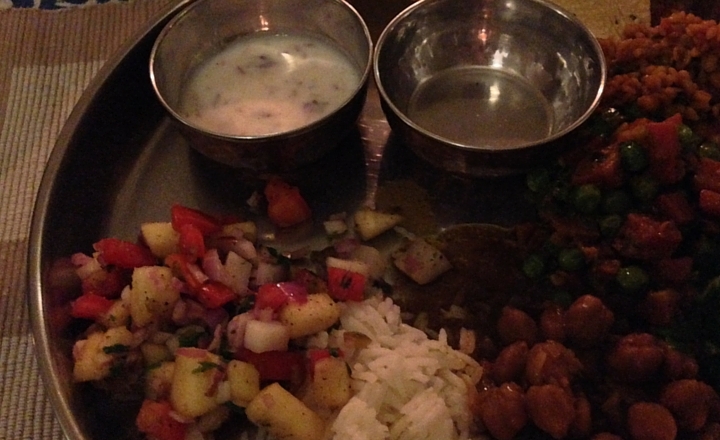 Soup, vibrant salads, vegetables, tarts, potatoes- western style food but each dish was packed with flavour. So carrots would be Moroccan spiced or pasta would have home made pesto. There was always a tiny piece of cake or a small pudding at lunch too which I loved; just a sliver to finish the meal. After the second safari when the sun starts to go down, a campfire is lit near the outside bar. This was my favorite time of day. A chance to sit with a drink, watching the flames and chatting to other guests and the resident naturalist about what we’d spotted on safari and on site. While you’re sat around chatting snacks are brought round to share. These would be veggie pakora and other nibbles. 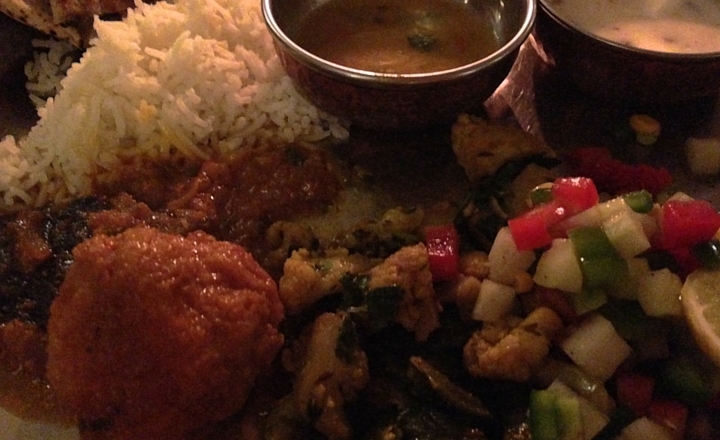 At 8pm we’d move into the dining room and dinner was an Indian feast. 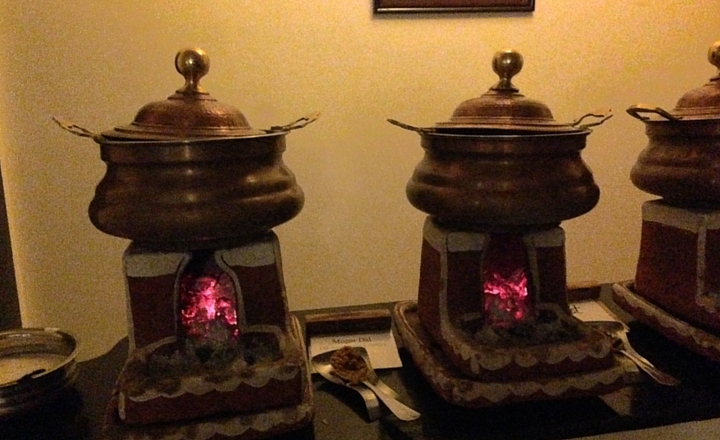 Every night the dishes were different but they were always a mix of rice, dal, curries, vegetables and chutneys. Then there were two or three different breads. The food was ridiculously good. It might be potato aloo, crushed aubergine, fried cottage cheese or mung lentils. I don’t think I would ever get bored. If I could have taken the chef home I would happily be a vegetarian. Back at the tent, it was a lovely surprise to find that not only had the heater been turned on (it’s surprisingly cold at night when the sky is clear) but we also had two hot water bottles in the bed! Now that’s service. This tent has ruined normal camping for me forever! With no alarm clocks or televisions to wake us, we would book an alarm call at dinner. At the designated time a member of staff would gently call from the door and leave a tray of tea or coffee with some biscuits on the table outside. If that’s not the most civilised way to start the day I don’t know what is. Sipping peppermint tea and watching the working in the fields, listening to the birds…it was like being on a different planet never mind a different continent. 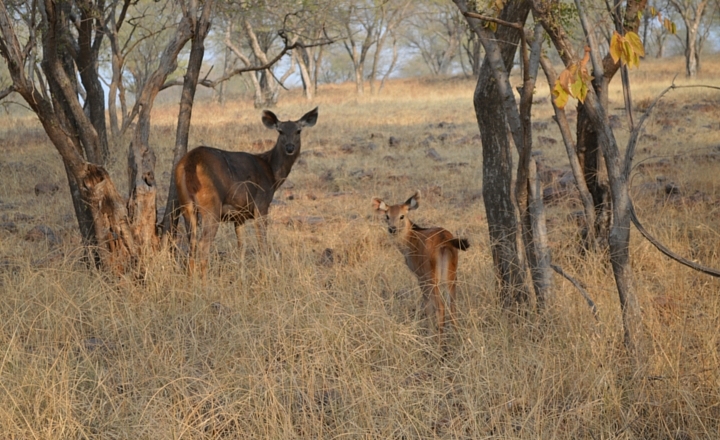 I took two safaris into Ranthambore National Park while I was there. You don’t know in advance which bit of the park you will be taken into, and we were so lucky that we saw tigers each time as some people didn’t see any. 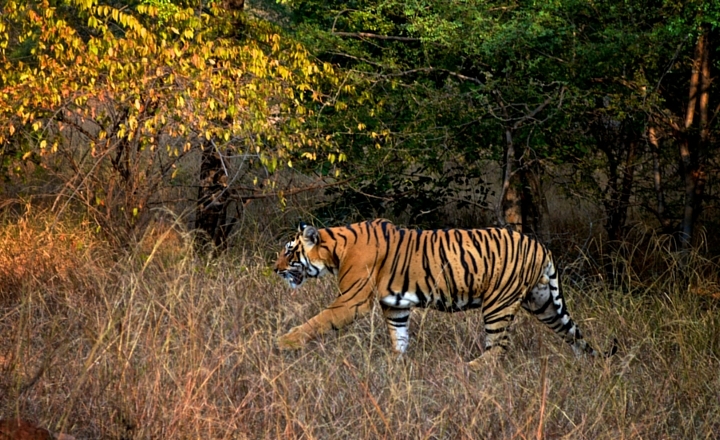 On my first trip out I saw three tigers, an adult male and two juveniles. One of the young ones was ridiculously close to the jeep- maybe two or three metres in front of us. I genuinely got quite emotional when I saw them, they are so majestic and strong it is breath taking. The safari isn’t just about tigers though. We saw samba deer, crocodiles, spotted deer, wild boar, monkeys, gorgeous king fishers, antelopes and even some sloth bears. Yes, we were *this* close! 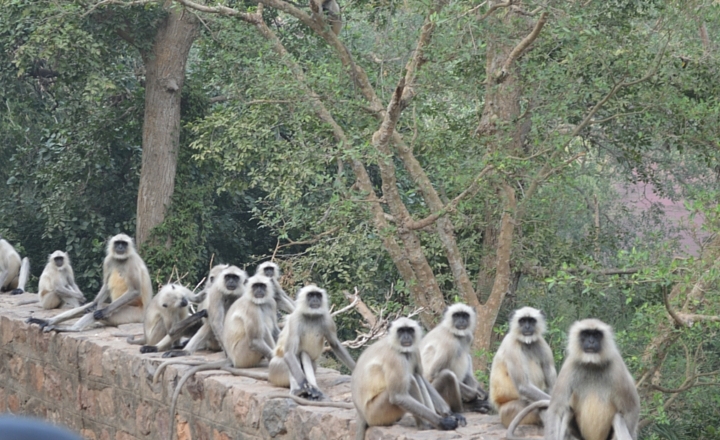 The monkies were quite the posers! 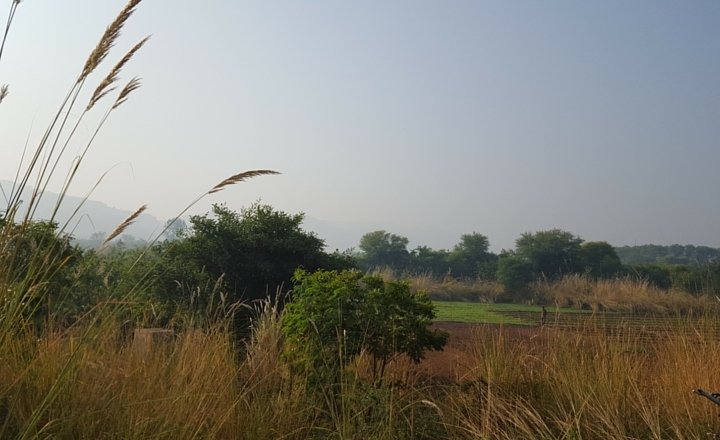 Khem Villas was built by the son of Fateh Singh Rathore who helped create Ramthambore National Park, so they are all about protecting the wildlife and also supporting the local community. There is also a spa on site which I didn’t get round to visiting but was hearing some amazing reports about it. And the shop is great – almost everything in there is made by a cooperative of women in the nearby village so you know that you can treat yourself to some beautiful made to measure clothes, a scarf or some bedding and the money is really making a difference. 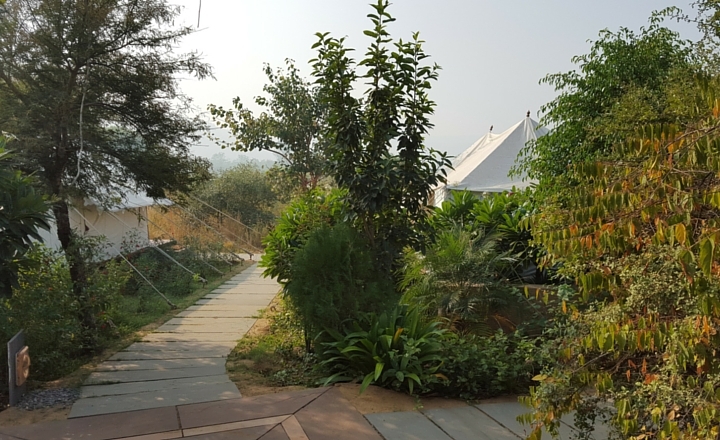 I thought that our trip to India would be a one off but I fell in love with Khem: the food, the staff, the location and the accommodation. So I am already counting the days until I can return and enjoy the experience all over again. Have you had a holiday with food as good as this? Do you have any Indian travel gems? Let me know, and I will add it to my travel bucket list!